As a wedding designer, I get asked a lot of questions about wedding décor. Is a wedding designer and a decorator the same thing? Where should we go to get our decor rentals and how much should we budget for it? Who will look after my set-up? Should we get real floral centerpieces or is it cheaper to get artificial ones? This is just a small sampling of some of the questions we’ve been asked. For today’s blog, it seemed like a good time to sit down and answer some of the more commonly asked questions (as well as a few of the unique ones) that we get asked. By no means is this everything you need to know, but hopefully it will point you in the right direction until you are able to talk to a perspective wedding designer or decorator and get more information. Q: What is the difference between a wedding designer and a décor rental company? A: A décor rental company has items that they rent out to clients based on the inventory that they have in stock. They rent you a series of items, but aren’t really involved with what the florist is doing or the other wedding vendors. 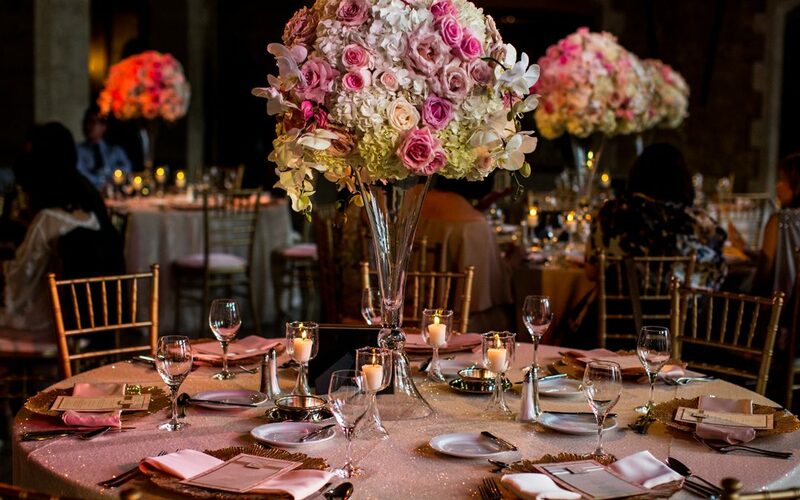 Although each decor rental company is slightly different in what they carry, their inventory will often include table linens, chairs, tables, candle votives, charger plates, and such. Some companies are a little more involved and will also include dishware, glassware, and flatware/cutlery, and even tents. They rent out their items to customers for events and/or weddings. Some will provide set-up/teardown services while others do not. Most will have some sort of delivery service available for an additional fee. A wedding designer is different in that they work with the couple to come up with a cohesive and unique vision for the wedding. This means not only working with you on the required decor rentals, but with all of the design vendors – florists, cake decorators, stationery, decor rentals and more. She or he then works with you to come up with an overall theme or style that will represent your wedding. This includes working with your budget, sourcing out the required items from various vendors (including you as part of the process, of course), and putting together price estimates. Their job is to bring your style vision together by working with you and all of your décor vendors, and then look after set-up and teardown on the wedding day itself. 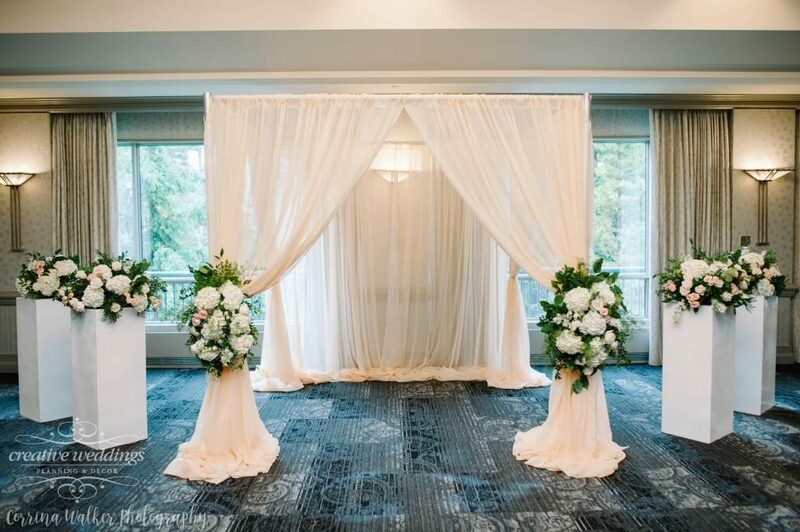 Q: Will our venue set up our wedding décor? What about takedown? A: The majority of venues allow couples to bring in their own décor, but with the expectation that the couple is required to set-up and teardown. Some venues will make allowance for table linens if they are brought in early. Others have a strict rule that they do not touch anything that the couple has brought in (to avoid problems if something is damaged). While some couples are able to gain access to their venue the day before the event to do set-up, the majority of couples have to do their set-up on the day of the wedding. As most brides and grooms have a few other responsibilities that day, they will need to hire someone to handle the set-up and teardown. One of the advantages of hiring a designer is that they will completely look after the set-up and teardown on the couple’s behalf, making sure their client’s vision comes to life exactly the way they envisioned it. Q: How much should we budget for décor rentals? A: As a wedding designer, I like to look at the overall wedding budget to make sure what our clients are spending on décor is in proportion to the rest of their wedding budget. Every couple has some items that they value more than others. For example, some couples prioritize food while others put entertainment first. For each couple it can be slightly different, but part of my job is to make sure that things stay in balance based on what is most important to them. I can give my couples expected and reasonable ranges of what things are going to cost so that they can preplan and prioritize. That way when they meet with vendors, they don’t end up overspending or committing to too much that will end up hurting the rest of their wedding. In fact, while we earmark money for flowers, stationery and décor, I don’t recommend finalizing these details until we have the venue and other key vendors in place. That way we know exactly what we are dealing with and can help ensure our clients stick to their budget. For many couples, the suggested amount to budget for Décor, Flowers & Rentals is 10% – 12% of the entire wedding budget. We can play with that number a bit if we are able to save in some other areas. Q: Is a wedding planner and a designer the same thing? A: Not always. There are some wedding planners who focus exclusively on the logistics of planning a wedding, which also includes sourcing out vendors, budgets, and timelines. At Creative Weddings, we do all of that, but we are also wedding designers. We like to work with a couple from start to finish and come up with a one of a kind event that incorporates the couples personal interests and love story. This involves everything from sourcing out your required wedding rentals that meet all of your needs, to finding you a florist to make bouquets and centerpieces that you will absolutely love, figuring out what pieces of wedding stationery will add the finishing touch to your wedding, and so much more. Wedding designers are not into cookie-cutter events. We want your event to be different from your friend’s or your sister’s. We want your guests to enjoy the atmosphere and the experience. We want the wedding style and décor to reflect YOU! Q: Does Day Of Coordination include set-up and teardown? A: Technically, Day Of Coordination Programs offered by wedding planners refers to management of vendors on the wedding day ONLY and does not include set-up and teardown. However, we have so many couples that request this service that we have different a la carte add-ons to help our clients depending on how much set-up and teardown assistance they require. Q: Are you best to get your rental items from only one décor company? A: This really depends on what the couple is looking for. For the majority of our weddings, we get rental items from a variety of sources. Working in Calgary and Banff, we have had the opportunity to work with numerous décor companies. We are familiar with their inventory as no two companies have exactly the same thing. As well, pricing can vary from décor company to décor company. It may be one price at one place and another elsewhere. Part of our job is knowing where to get items at the best price for our clients. As well, sometimes the size of the rental items can influence this decision. For example, linens and charger plates fit easily into my vehicle. That makes it possible for me to pick-up and return these types of items on behalf of my clients. If they want to get specialty chairs, however, like Chiavari or Tuscan chairs, those must be transported in a delivery truck. If I have a wedding that requires a lot of large items, then I might recommend to my client that we use one décor rental company to save on delivery charges. Q: Is it better for couples to use non-floral centerpieces? Are they cheaper? A: This is a personal question that only can be answered by the couple. It really depends what you’re looking for. The majority of our couples choose to use some type of floral centerpiece designed by our wedding floral designer. The cost of these centerpieces vary greatly depending on what the couple like as we do everything from smaller cylinders or bud vases to more elaborate candelabras, garlands and taller centerpieces. True, these items do need to be cleaned up at the end of the event, but our floral designer comes in and looks after this specifically as it is the last thing that a couple wants to think about at the end of their wedding. Floral centerpieces also add to the uniqueness of your wedding, representing your style and vision. Some people choose to use non-floral centerpieces because one or more of the guests are highly allergic to flowers. There are some great options from lanterns to lampshades, candelabras and more. You do have to be careful about non-floral centerpieces that utilize silk flowers. When they are brand new, they look pretty good, but as they go out weekend after weekend they start to have a “used and abused” look. Once again, this is where your wedding designer can work to your advantage as they can present a few options to you to make sure you have the best options available that work with your budget. Cost of centerpieces really depend on the components and the size. I’ve seen non-floral centerpieces that cost more than floral ones, and vice versa. You can’t make a unilateral statement either way. You are best to get all the information and get a better idea of costs from your designer so you can make the best decision for you. Q: As a wedding designer, do you have your own rentals? A: Yes and no. I do own some products, like vaseware, candle votives, LED pillar candles, candelabras, and even a few specialty backdrop structures. These are items I use on a fairly regular basis or they were built with a specific purpose in mind (like the backdrop structures – a dark wooden four-point gazebo structure, a floral moongate frame, and solid white arch specifically to bear the weight of a full floral arch). 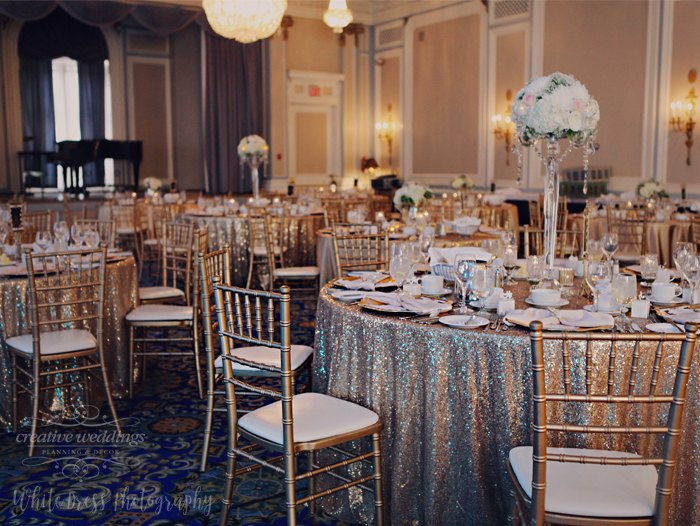 I don’t keep things like chair covers, table linens, or napkins in stock as there are a ton of options available in Calgary and area through the various décor rental companies, which means my couples have a ton of choices available to them. If I had these in stock, then I would be pushing the same inventory on all of my couples and I don’t like to design that way. I prefer for us to have a blank canvas and be able to make it exclusively for them. Q: Will a decorator/designer be at my wedding to oversee the set-up? A: This really depends on the company and how big it is. Décor rentals companies deliver items, and may even has a team to set things up, but the team may not include the person you originally spoke with or who helped you decide on specific items. At Creative Weddings, all of our designers are onsite to oversee the set-up of your wedding décor. That is a critical part of our services to ensure that your wedding looks exactly like you want it to. Regardless of who you use, make sure you ask who will be there to oversee the set-up. Don’t make assumptions or you may be disappointed! Tell us what else you want to know and ask us your wedding décor questions here. If they fit, we’ll definitely add them in to this blog article. To learn more about our Wedding Design & Décor Programs, please contact us at either info@creativeweddings.ca or 1-888-790-6986, ext. 705. Cathy MacRae is a Calgary, Banff, Canmore and Lake Louise wedding planner in the business of designing customized weddings that make your heart skip a beat! She is the lead wedding planner and design coordinator for Creative Weddings Planning & Decor©, working with couples to plan customized bespoke weddings that make your heart skip a beat! Located in Calgary, Canada, she plans wedding for couples primarily in and around the Calgary, Banff, Canmore, Lake Louise, and Fernie area. Her clients want a wedding that is all about romance, elegance and personalized style with meaningful and heartfelt moments that take your breath away and created an incredible guest experience. She has been in involved in the wedding industry for over nine years now. The foundation of her business has been built on developing relationships with numerous quality vendors that her allow her to best match them with her clients so the end result is a unique wedding celebration that tells a story and sets the stage for the couple’s “happily ever after.” As a destination wedding specialist, she also works with couples who desire to wed in various picturesque dream locations throughout the world. She had done weddings in various exotic locales such as Hawaii, Mexico, Costa Rica, and throughout the Caribbean. She is available to plan weddings internationally. 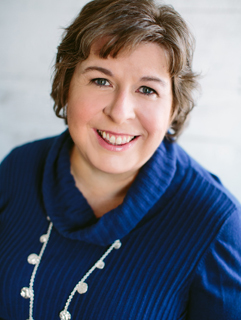 She has earned her Professional Wedding Planner© status with the Association of Bridal Consultants, and is also a member of the Wedding Planners Institute of Canada, the Calgary Bridal Alliance, and the Community of Wedding Innovators. In addition, she is a Certified Sandals Specialist and WeddingMoons© Specialist with Sandals© and Beaches© Resorts, specializing in romantic travel. She was a founding board member of the Wishing Well Wedding and Event Foundation, Canada’s first non-profit wish granting founding providing weddings for couples directly facing terminal illness, and continues to support the foundation in the role of a STAR vendor. Cathy also owns Consulting For Creatives, where she works as a business coach with both new and experienced entrepreneurs in the wedding and event industry with a desire to get ahead. For more information about planning your own wedding or for advice from Cathy, please contact her at 1-888-790-6986 or email her at info@creativeweddings.ca.